A Winnipeg Transit supervisor was assaulted on a bus after a dispute over insufficient fare escalated into an attack. The driver is recuperating in hospital. Three suspects are facing charges after a Winnipeg Transit supervisor was assaulted on a bus when a dispute over insufficient fare escalated into an attack. Around 8 p.m. on Thursday, police say, a man and two male youths boarded the bus near Portage Avenue and Colony Street, but one didn't have enough money to pay the fare. They became verbally aggressive and the supervisor asked them to leave the bus. The suspects punched the supervisor and dragged him off the bus, where he was punched and kicked some more, police said. "You've got three males, grown, moderate size, attacking one guy. No different than if it was one of our officers without assistance of weapons. It's a dangerous position to be in," said Winnipeg Police Service spokesperson Const. Rob Carver. Police officers and cadets happened upon the scene and interrupted the attack, Carver said. "It's very lucky in this case — pure chance that uniform officers and cadets were right in the area as the fight was happening. We interrupted the fight by accident, effectively," Carver said. The supervisor was taken to hospital in stable condition with non-life-threatening injuries. The three suspects will be charged with assault, and were released on a promise to appear. Carver says he is hearing about more assaults occurring on Winnipeg Transit buses than in years past. "I can tell you a number of years ago, I don't think I was standing up here talking about any, essentially. And I think we're talking about them fairly regularly now," he said. Security concerns on city buses have been in the spotlight in Winnipeg since February 2017, when Transit driver Jubal Fraser was killed while on duty. In January, the city announced it was hiring five former drivers to be inspectors to improve security on buses. The Amalgamated Transit Union Local 1505, which represents drivers, has said it wants to see a mix of highly trained undercover and uniformed security staff working daily as transit police. Local president Aleem Chaudhary says while the city can not afford to place a police officer on every bus, the possible presence of undercover officers would serve as a strong deterrent. Chaudhary says he has been told of other assaults on supervisors, and claims the city does not inform his union about them. Transit supervisors are members of another union, the Winnipeg Association of Public Service Officers. 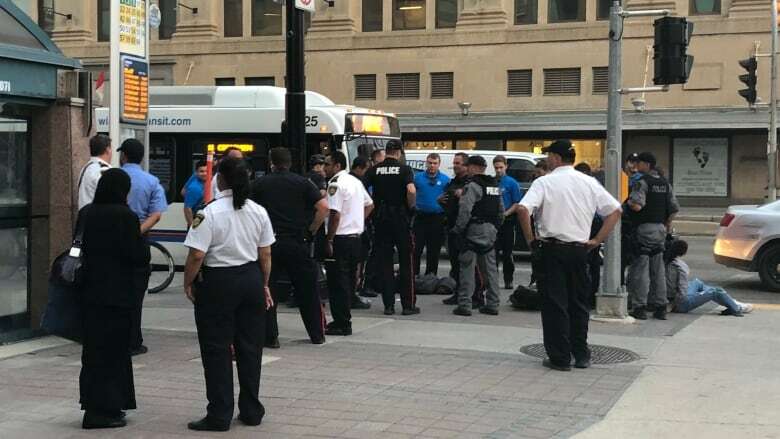 A memo circulated to Winnipeg Transit employees on Friday makes reference to a separate assault on a transit supervisor on Thursday. Carver said he was not aware of other recent incidents. Chaudhary also says he is upset the three suspects in Thursday's assault have been released on a promise to appear. The sole adult among them is known to police, Carver said.